Dave Elger on Running, Racing and Training: New Running Shoes for Under $40! New Running Shoes for Under $40! 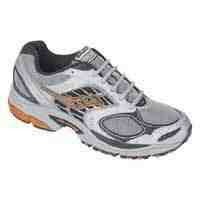 I picked up a pair of Saucony Grid Formula TR at Big Five Sports for $39.99- they feel great! Replace the removable insole with something a little more stable. I am using Spenco's Polysorb Total Support Premium Insole.